Tremors of the approaching cataclysm appeared throughout European art in the years before 1914. A convulsive sequence of movements rocked the art world: the Expressionists in Germany – Die Brücke (Bridge) and Der Blaue Reiter (The Blue Rider), the “Wild Ones” of Fauvism and Cubism in Paris, and the Italian and Russian Futurists. In Britain, a disparate group of artists, poets and writers also came together on the eve of the war, determined to send lightning bolts through the middle class Edwardian society they scorned. It was a uniquely short-lived flash of anger and rebellion – a “great burst of energy”. This belligerent loose grouping was undermined as soon as it was founded, by the outbreak of the war and later on, by the thoughtless dispersal and disappearance of many of its chief creations, as Tate curator Chris Stephens has noted. The Vorticists is the first major presentation of the movement in the Internet age and the first in the United States since 1917 – where this show began – and the first ever in Italy. It offers new insights and discoveries, enhanced by ephemera from the Tate’s archives and what are probably the world’s first-ever abstract photographs by Alvin Langdon Coburn. An illustrated pocket guide by Tate Britain reproduces derisive cartoons and comments, including from established artists like Walter Sickert who joined the chorus of hostility. But challenging the “any child could do this” type mockery were some few sympathetic critics like Frank Rutter and TE Hulme (who died in action in 1917). The exhibition opens with a full frontal assault – Jacob Epstein’s reconstructed ghostly monster, the Rock Drill, which dominates a shocking pink space. This evocation of relentless mechanical power is an archetypal image of male virility, as aggressively spidery today as it would have been back in 1913. The show’s other piece de resistance is Gaudier’s monumental Hieratic Head of Ezra Pound – probably the ultimate phallic sculpture. Whether or not you are already familiar with Vorticism’s strident manifestos, there are new insights and surprises to be found here. It has always appeared as the ultimate aggressive macho movement, inspired by the bombastic Italian Futurist pro-war Filippo Marinetti and the English painter Percy Wyndham Lewis. Lewis joined up with American poet Ezra Pound, French sculptor Henri Gaudier-Brzeska and US photographer Coburn around 1913 to make art for the 20th century’s new machine age. In fact, despite being so short-lived, the movement brought together both male and female talents – from the worlds of literature, poetry, anarchist philosophy and politics, drama, the suffragette movement, photography and most notably, sculpture. In spite of its provocative and staccato cries and shouts, not to mention ferocious attacks on other artistic tendencies, the movement was sharply contradictory. It had a softer, more subtle and varied side. Vorticism was a brave attempt to break free of suffocating Edwardian society and with courage and chutzpah – especially from the women who were crucial to its existence – it defied the conventions and morals of the day. Art historian Mark Antliff underlines the powerful connections between Gaudier, the brilliant US poet Ezra Pound and the English anarchist and suffragette, Dora Marsden. She edited The New Freewoman and The Egoist between 1913 and 1919 and published many Vorticist writings and images. 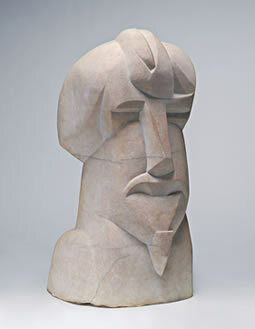 The sculptor Gaudier was so devoted to his Polish partner Sophie Brzeska that he took her name. 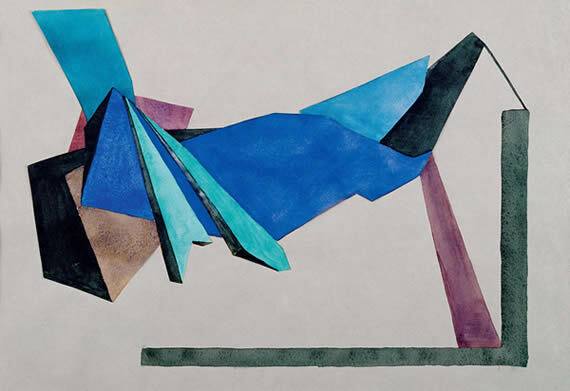 Three leading Vorticist painters were women: Helen Saunders from Chicago, the English painter Jessica Dismorr and Ezra Pound’s talented wife, Dorothy Shakespear. The first issue of Vorticist magazine Blast only appeared thanks to a £100 loan from Wyndham Lewis’ lover Kate Lechmere. Austrian writer Frida Strindberg opened the Cave of the Golden Calf, an avantgarde West End club and bohemian haunt which Lewis decorated. USA) © Estate of Edward Wadsworth. There was some serious theory behind what some derided as childish venting of anger, including Max Stirner’s anarchism and the French Philosopher Henri Bergson’s Creative Evolution. Edward Wadsworth, whose abstract woodcuts are amongst the high points of this show, studied in Munich in 1906 and went on to translate On the Spiritual in Art, by the Russian master of abstraction, Kandinsky (1912). 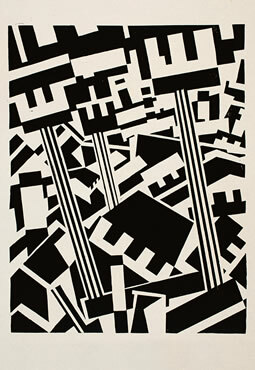 Blast was inspired by Marinetti’s Futurist manifestos, and it came into being at the end of 1913, at the same time as Lewis’ Rebel Art Centre. Ezra Pound saw the movement as a “confluence of energy” which he called the Vortex, an image espoused by Lewis, who saw it as the great silent place where all the energy is concentrated: “The Vorticist is at his maximum point when stillest.” It was a great image, drawing out what threw these talented individuals together – they were lightning rods for the massive tensions as one epoch of history came to a juddering end as the imperialist war machines geared up. In this respect, the British movement picked up on the same currents as its Continental counterparts. Two decades later Lewis was to write in a disgruntled way, that “as an artist one is always holding the mirror up to politics without knowing it”. He and others may or may not have wished to recognise the forces that affect all of society, but what some term the Zeitgeist, and others the dialectic, did recognise them. Many of Vorticism’s leading members, were themselves ground up by the very war machines they had foreshadowed in their drawings and paintings. Perspectives changed massively as the gung-ho nationalism of 1914 was replaced by growing horror at the carnage of war: over a million soldiers died on the first day of the battle of the Somme. In June 1915, Gaudier, perhaps the most brilliant British sculptor of his day, died aged only 23 in the trenches at Arras in northern France. The second Vorticist exhibition at the Penguin Club in New York in 1917 was to be its last. And the fate that was awaiting the exhibitors, as Stephens and others have remarked, gives an elegiac quality to this exhibition too. The Vorticists: Manifesto for a Modern World is at Tate Britain until 4 September.